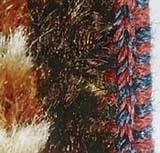 Confusion over what to call two unplied yarns used together in weavings has caused more ambiguities and errors in rug analyses than almost any other terminology issue. Almost everybody correctly identifies a warp or weft yarn like that on the left below as a TWO-PLY WOOL YARN. But after that, the problems begin. A spun fiber like the one in the middle (below) is properly called a WOOL SINGLE, or a single-ply wool yarn. Two spun fibers used together, but not plied, as in the finger skein on the right, are simply called TWO WOOL SINGLES. 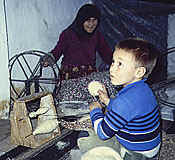 To prepare two wool singles for convenient use as a weft or for knotting, an artisan may simply roll the yarns together into a ball from spindles, as this child is doing. For a weft, the pair of yarns can be wound into a small finger skein (or "butterfly") as on the right above. Since wool is sticky, the two singles cling together nicely. They may occasionally twist together, but this does not make them "loosely plied." We find the expression "winder ply" in a few rug books, but this is also meaningless, as no twist is added to yarns merely pulled from skein winders. In fact, two wool singles pack together much more tightly in a weaving than if the two are plied, since plying increases the unit's diameter. Two thin unplied yarns can slide more easily into tiny crevices. This is true for both wefts and for pile knots. In analyses, we should try our best to distinguish between two singles used for a weft and two-ply yarn, as this often seems to have diagnostic relevance. Admittedly, this can sometimes be difficult, but often analysts have just automatically written "2-ply" or "Z2S" when that has been incorrect. Since wool pile knots have most often been tied with two or more singles, they should not be described as 2-ply, or 3-ply, etc.-- unless we are sure that they have indeed been plied. Coarsely woven rugs with long pile like julkhirs, gabbeh or fitilli are the most likely to have pile knotted with plied yarns, although those yarns may have retained their ply only in the knot collars. What's wrong with the word "strand"? This word has a multitude of meanings but applies most correctly to unspun long staple fibers like flax, or filaments like silk. The term is also used traditionally for describing the working units in twining, basketry and braiding. The word has often confused rug analyses because of uncertainties about whether it has meant a yarn, a yarn component, or a working unit. See pages 48-49 in Woven Structures. PLEASE NOTE: If two yarn singles are put through a shed together, they make up ONE WEFT (or one shot, or one pick). In a recent Cloudband on-line discussion, someone asked about knotting irregularities in Chinese rugs. I've discussed these assorted practices is Woven Structures (pages 35-37), but think that a couple of additional illustrations might be helpful. 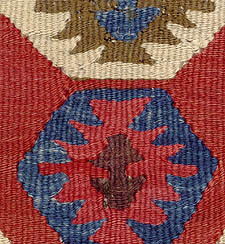 Similar details occur in old experimental Central Asian rugs, where they have typically been overlooked by analysts. 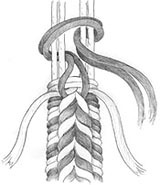 Knots are described as STACKED when two are tied, one above the other without a weft in between, as in the drawing below. Knots may be stacked either individually or in rows. 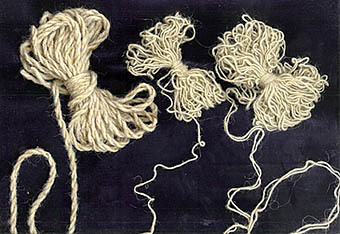 Along the top edge of each round "clover leaf" in the Ersari detail photo, a short row of four red knots has been tied, then four brown knots have been tied directly above them, without an intervening weft. In the coarse weave, this has helped to round the forms slightly. In the center of the photo (in two places), one brown knot has been stacked with one pale yellow knot. In the center of the clover leaves, knots have also been stacked to squeeze a little extra blue wool into a limited space. In the Chinese rug below, knots of two different colors have also been stacked to help shape curves in the design. In several areas, blue and yellow wool knots share the space usually occupied by one knot; in other areas dark blue and medium blue are stacked; occasionally two knots of the same color are stacked. The wefts are white cotton. For finer detail and more flexibility, some weavers have used HALF KNOTS -- knots half the thickness of regular knots. Chinese carpet weavers who have used four wool singles together consistently for most of their pile can tie knots with just two singles to help shape curves or add small touches of color. Turkmen weavers who do most of their knotting with two wool singles make half knots with just one single. Here is what's possible then: Two regular knots may be stacked, two half knots may be stacked, a regular knot may be stacked with a half knot, or a half knot may be used alone. These variations offer a practical way to circumvent the limitations of the omnipresent grid. In this Chinese rug, I have marked several stacked combinations; with a little hunting, you should find more. Try following each row of knots from side to side, and the irregularities will become obvious. 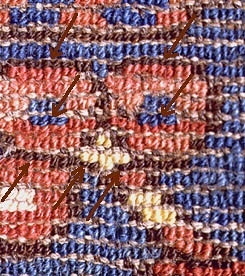 Weavers may overlap either whole or half knots. An isolated OVERLAPPED KNOT often slants, or forces the knot(s) beneath it to slant; thus this can be an especially useful device for defining curves. The arrow in the left center of the photo indicates an overlapping yellow knot. In other rugs we find this trick used more frequently. Yomut and Saryk weavers have often overlapped rows of knots to build bulk and straighten their weavings; this is a different practice, and is discussed on page 37 of Woven Structures. 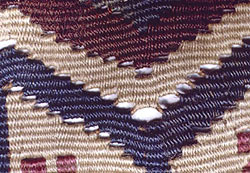 OFFSET KNOTTING has been used extensively by Chinese, Kurdish, Saryk, Yomut and occasional other weavers to create smoother, steeper diagonals in their designs. I intend to illustrate this practice later here; meanwhile, it is discussed on pages 35-36 of the book. Occasionally someone asks me if there is any way to know which end of a slit-tapestry kilim is UP-- which end was woven first. With geometric Caucasian pieces constructed mainly with stepped forms it may be nearly impossible to tell for sure, but many Anatolian kilims with smooth diagonals offer good clues. As you surely know, most slit-tapestry artisans weave their pieces in a quite free-wheeling manner-- in sections, rather than with series of discontinuous wefts arranged in a single row across the warp. That is what makes the process so much fun, and so much more intuitive than other weaving techniques. You can weave sections in any order, but only UP TO DIAGONALS. In other words, you must always build a pyramid from its base upward--as in the first drawing (A). You can't stand a pyramid on its point, without wefts underneath; you cannot weave ABOVE any diagonal first. If you leave warps open underneath, as in the second drawing, how could you weave on them later? It's impossible, except with a needle, because there is no way to open a shed for the wefts in such an area (B). The typical slit-tapestry weaver might weave a series of shapes, as in (C). THEN she can fill in concave areas (D). HERE'S OUR CLUE to which end of our kilim was UP on the loom: Weavers tend to pack fewer wefts into those somewhat constrained or enclosed spaces, so that dipping, or downward- curving wefts result. I have made mine red. 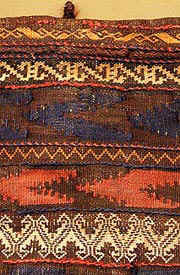 In the Konya kilim shown below, such fillings dip clearly in many places; to detect similar features in other kilims may require a closer look. In some instances, of course, weavers have purposely built up curved shapes with oblique wefts. That is a different matter. HOW ABOUT HANGING KILIMS HORIZONTALLY? Nearly every weaving is stronger in its warp-wise direction. Warp yarns are usually composed of long-staple fibers that are spun and plied tightly to withstand the great tension under which they are held and manipulated on the loom. Wefts, on the other hand, are typically softer, more fluffy yarns--spun that way purposely to cover well and maintain a flexible handle in the fabric. They are often yarn singles. Because of their unique construction, we need to give more consideration to how we hang kilims than other weavings. Frail antique Anatolian, Caucasian or Persian kilims made with slit-tapestry techniques should not normally be hung sideways unless they are sewn to a heavy supporting fabric. The slit construction that allowed the weaver so much freedom is a shortcoming in the final product. If such a piece is suspended sideways, both warps and wefts suffer extraordinary and unintended stress at the end of every slit. The photo on the left below shows an old Erzerum kilim in a vertical position, with no problems. But look what happens, on the right, when the same kilim is hung horizontally! Weight distorts the warps and the separately woven sections pull apart unnaturally, so that yarns can easily tear. No conscientious conservator or collector will subject an early piece to such unnecessary stress. What's the solution if your ceilings are not the 10, 12 or 14 feet high that your kilim seems to require? One solution is to hang a large piece over a pole at the 8 or 9-foot point your wall permits. Although this is less than ideal, we should keep in mind that when kilims were displayed by the weavers themselves as camel covers on their migrations, only portions of each were visible. Used in the tent, as dust covers over storage sacks, a rough fold down the center lengthwise was usual. If you have the luxury of a wide wall, it may be practical to mount your kilim horizontally on heavy canvas-- either loose and free hanging, or stretched over a wooden frame. The kilim must be stitched throughout by hand to the canvas. See our section on Mounting Rugs and Textiles. A handsome decorative selvage made with two contrasting colors appears on many eastern Anatolian rugs. 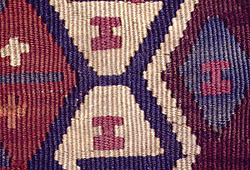 Mark Hopkins photographed this detail on a small knotted-pile yastik that is probably Savak Kurd from Malatya Province. The diagram shows how the weaver wraps or 'ties' vertical series of symmetrical knots over two pairs of selvage warps, using two sets of wrapping yarns of contrasting colors. Pairs of yarns do the wrapping and before each wrapping set is combined and brought upward, the previous pair of yarns is split, with one end pulled to each side. What a clever person devised this one! The diagram does not show the rug's ground wefts. Those thin wefts alternate with the wrappings, and because they interlace the four selvage warps individually, they flatten and strengthen the structure. Harald Bohmer has included a schematic drawing of this construction on page 119 in the book he co-authored with Werner Bruggemann, Rugs of the Peasants and Nomads of Anatolia. He calls it a 'V-form' decorative selvage, although the yarns actually form upside-down V's as they are worked on the loom. Alternately, we can call it a selvage with split symmetrical wrapping. 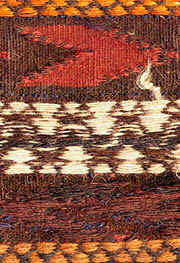 Of the rugs in the Bruggemann/Bohmer book, 14 have this selvage--all knotted-pile rugs from Eastern Anatolia. I wonder if anyone has found this decorative selvage construction on rugs from other areas? Has anyone seen it on flatwoven textiles? Weft-substitution details are among the most consistently misidentified rug features. Daniel Deschuyteneer sent photos of a Baluch bag that is a virtual compendium of motifs found both individually and in combination on the skirts of pile rugs, so it offers a good opportunity to examine this weave. Anyone who has paid the slightest attention to Baluch rugs is surely familiar with the small yellow undulating border along the top of this bag. 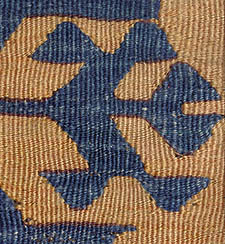 But variations on the wide orange, blue and brown chevron shapes appear frequently on the skirts of early Baluch rugs too. Unfortunately, there is no good popular term for this weave, and so we are left with the generic structural description, weft substitution. The weave is actually simpler than the name: it is a perfectly plain weft-faced weave, except that one colored weft yarn substitutes for another to make the design. It is easier in concept than in practice! V. Moskova used the term "gajari" to describe both warp- and weft-substitution weaves in Central Asia, but those two basic weaves are easily enough confused without adding an ambiguous label. In Iran, the structure, along with complementary-weft weaves, has often been called "suzani," another term that is improper, since that means "embroidery." When not being used in the design, each weft-substitution yarn floats on the back--usually. The large chevrons in this piece present an exception. Because it is impractical to float yarns across such wide spaces, most weavers reverse them, to weave back and forth in those broad areas. 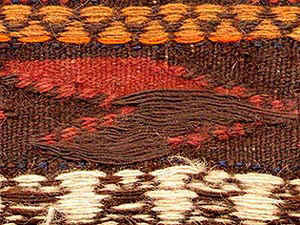 In the orange and brown chevron motif at the right, yarns float on the back only along the diagonal edges where they articulate small bars. In the wide blue/brown band, the brown yarns have been floated or woven continuously from selvage to selvage, while the blue yarns have been repeatedly reversed. In the large detail photo below, this weaver has switched midstream, trying both methods with her brown yarns. The impracticality of the long floats should be apparent. These loose yarns can easily catch on objects and snag. They add unnecessary weight to a bag, and are a waste of laboriously produced handspun yarn. In rug literature, we have seen the structure in these broad chevron patterns sometimes called "interlocked tapestry" or "interlocked kilim." This is incorrect. 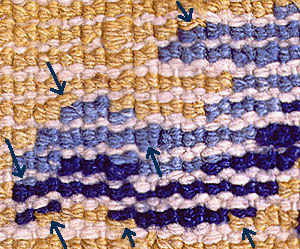 We have seen other weft-substitution patterning called "brocading," "supplementary-weft weave," or even "embroidery." It is none of these! It has also been called "weft-float patterning"--a useless term which fails to distinguish this structure from the brocading that appears more rarely in Baluch work. To see several more examples of weft-substitution patterning, check out the End Finishes Project. The tiny wrapped and bound borders in the photos here are also examined-- along with lots more! Weft-substitution weaves are discussed and illustrated in Chapter 7 of Woven Structures, interlocked tapestry structures in Chapter 6. 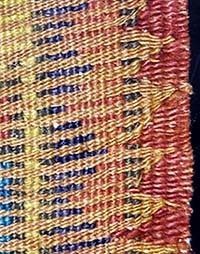 An unusual Salor ensi selvage construction that uses this technique is shown on page 150. A friend has brought me a Senneh knotted-pile rug, along with a bunch of questions: Why do the backs of these pieces have such a distinctive "sandpapery" feel? How can the knot counts be so high with symmetrical knots? When the pile is worn, why do the knot collars seem to slant in opposite directions, looking a little like countered soumak? And finally, how should we describe this structure, since it looks as though first one warp is "depressed," and then the other? All good questions! This particular rug has a warp-predominant ground weave, with twice as many warps as wefts per inch, and the wefts are heavy and straight. With each knot tied on two warps, horizontal and vertical knot counts are the same. Because heavy, taut wefts were inserted with no ease, they forced each warp into a sinuous path. To crowd in more knots, these weavers consistently pulled the left sides of their knots slightly tighter than the right. Thus on one row, the left side of each knot was pulled down over the heavy weft below it. 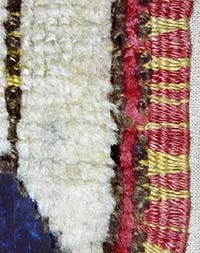 On the following row, where the left warp of each pair was underneath, the heavy weft prevented the knot from pulling into a position similar to that of the proceeding knots. On the back of the rug, a bumpy, pebble-like surface was formed. Most of the light warps are visible on the surface, while most of the wefts are hidden. With finer weaves, the ground weave elements may be nearly obscured. It is not appropriate to speak of warps as "depressed" when we describe this kind of weave. Neither set of warps lies on a plane below the other and the rug's back is actually "flat." Technically, this is a warp-predominate rather than weft-predominate or balanced weave. On Central Asian julkhirs and tent bands, knots are tied on warp- predominant or warp-faced weaves, but in those objects, knots are tied only on alternate warps. The Central Anatolian knotted-pile rug shown in the first photo here demonstrates a rather novel approach to the construction of an attached selvage. 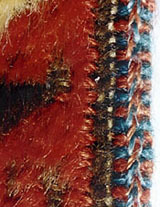 This rug has from 4 to 6 pale yellow ground wefts between rows of knots, and successive series of these wefts were extended differing distances into the selvage area. Here they met heavier red selvage yarns that likewise were extended varying distances, so that a zigzagging red and yellow selvage was formed. We properly classify this as an attached selvage, because the outer warp units were almost entirely free-floating on the loom; in fact, all four selvage warp units (four pairs of warps) were free-floating in some areas, where they were not interlaced by the ground wefts. One red selvage yarn was extended slightly into the knotted field at the tip of each triangle. ATTACHED SELVAGE: 4 warp units (2,2,2,2) interlaced in triangular sections by the yellow ground wefts, with the intervening reciprocal triangular units interlaced by heavy red wool singles. The red selvage yarn extends slightly into the knotted field at each zigzag point. SELVAGE: 4 warp pairs interlaced by the yellow ground wefts; irregular banding produced by extra interlacing with red wool singles. To my knowledge, no one has published information on the selvage constructions of Konya Province carpets and vastly different weaving practices have been overlooked.